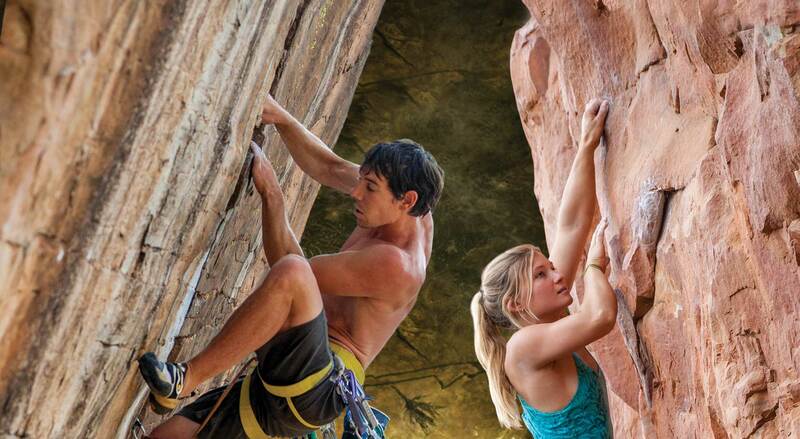 Alex Honnold (USA) and Hazel Findlay (UK) head to Southern Africa for an experience of a lifetime. Africa Fusion takes us from the breathtaking orange granite and vast landscapes of Namibia, through the desert and across to lush red sandstone of Waterval Boven in South Africa. Carrying on the journey in South Africa we follow Alex and Hazel North to the wild and remote Blouberg (Blue Mountain) range. From the North we then journey far South to Cape Town, where Alex and Hazel explore a city crowned in mountains, from rock face to rock face. Their odyssey reveals surprising treasures and world-class climbing – while experiencing the joy of the journey along the way. Join them as they uncover these hidden gems in unforgettable settings. Produced by Robert Breyer of Fresh Rock Films. While watching African Fusion I kept feeling an overwhelming sense of pride. This was my home. Those beautiful routes, those alluring mountains and rock walls belonged to the country of my birth. And Alex Honnold and Hazel Findlay, the international stars of this movie, had such amazing things to say about this country and the climbing it has to offer. 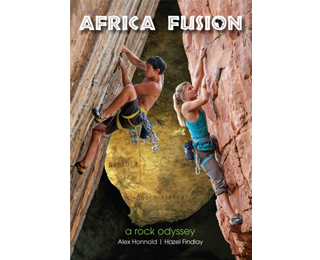 African Fusion takes you on a journey to some of the best climbing areas in Southern Africa. It captivates you with sensational climbing. It brings to you, in no uncertain terms, the harshness of the African plains and the beauty of the sweeping granite slabs of the Spitzkoppe in Namibia, the brooding and imposing walls of Blouberg, and the captivating red crags of Waterval Boven in the northern part of South Africa.Then whisks you south to the Western Cape’s wild Yellowwood Amphitheatre, the unforgiving steeps of The Mine and of course to the iconic walls of The Ledge on Table Mountain. The movie shows Alex and Hazel, along with some of SA’s top climbers, scaling a bunch of the finest routes – trad and sport, single- and multi-pitch. The climbing is nail-biting and brought right onto your face with brilliant and dramatic filming, but what I also like is that it has been infused with a very African flavour by weaving snippets of African life and customs throughout the film. I also enjoyed the conversations between Alex and Hazel – the bantering and ribbing. It added a somewhat human touch to the movie; a movie that will keep you on the edge of your seat throughout its 52 minutes. TV broadcasters to show our film. Climbing gyms to screen the film. WE MISSED THE ONSIGHT BY A FOOT POP, BUT I DIDN’T CARE BECAUSE ALEX FELL OFF AND I DIDNT, AND THAT MAKES A MEMORABLE DAY IN MY BOOK. Africa Fusion is available to buy or rent through Vimeo on Demand.